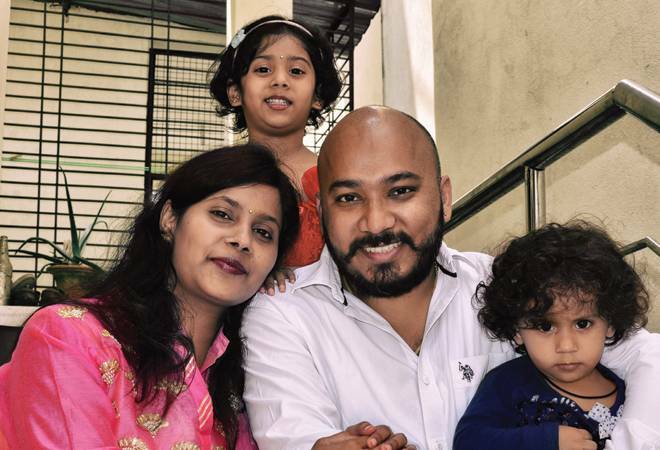 Rohit Parashar, 35, is a sales manager with an MNC who stays in a rented flat in Nanded, Maharashtra, with his parents, wife Maya, a 29-year-old teacher, and daughters Yashika (aged 4) and Tanisi (aged 1). The couple's net salary is Rs1.77 lakh per month and they have a surplus of Rs88,583 after meeting all expenses, including insurance premiums, a vacation cost of Rs8,333 and Rs20,000 for dependent parents, among others. For life insurance, Rohit and Maya have purchased an endowment plan with Rs5 lakh sum assured that costs them an annual premium of Rs25,000. As for health insurance, they have a family floater plan of Rs5 lakh and pay a yearly premium of Rs18,000. Other assets include a plot of land worth Rs13,50,000 and investments in mutual funds through a monthly SIP of Rs25,000. 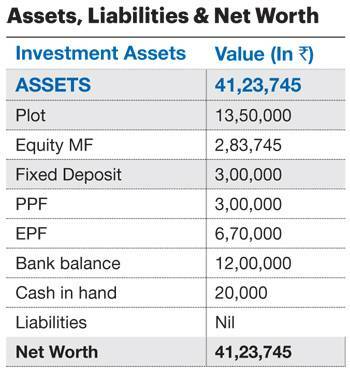 Rest of their savings are kept in bank accounts (see table Assets, Liabilities & Net Worth). The couple has several short-term goals, including buying a second plot of land worth Rs12 lakh in 2018 (for investment purpose) and a house next year for self-occupation, which will cost around Rs40 lakh. They also want to purchase a car by 2020, priced at around Rs15 lakh, and go on a dream vacation by 2022, estimated to cost around Rs10 lakh. In the long term, they are looking to build an education corpus of Rs75 lakh for each daughter and a marriage fund of Rs50 lakh for each of them. 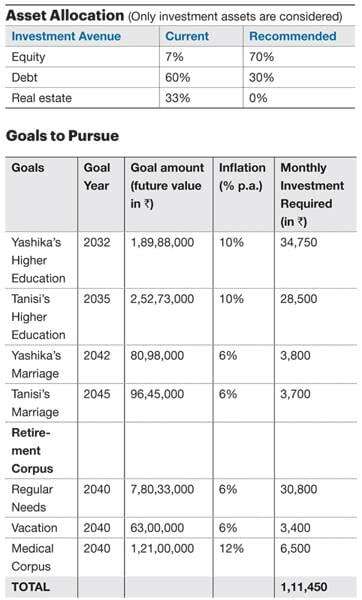 Finally, Rohit and Maya should be able to fund their retirement as they are planning to go off work in 2040 and want to have a monthly income of Rs75,000 in today's value to meet their post-retirement expenses (see table Goals to Pursue). All these will take some meticulous planning as their investments are skewed towards realty and bank deposits. While real estate lacks liquidity and fails to generate any regular income, a high bank balance means missing out on the opportunity to earn effective post-tax returns. The family should look at investing into assets yielding effective post-tax returns without compromising on the liquidity factor. Ideally, they should sell the real estate to fund their home buying. Their plan to buy a second plot for investment purpose should also be avoided as it will become another non-liquid asset. For now, they should reduce the vacation goal to Rs6 lakh. Moreover, the goals regarding their daughters' education and marriages look a little ambitious and need to be revised. On the other hand, they have taken the first step in the right direction by investing in mutual funds and this should be increased and continued. The couple must invest Rs1,11,450 per month and annually increase it by 10 per cent to achieve all their goals. But currently, they are falling short of the target, going by the existing cash flow. Their incomes are rising, though, and they will be able to reach the investment target in about five years from now. Even then, cash flows could be erratic, and it may not be possible for them to start saving for all the goals all at once. So, they need to increase their savings and investments in line with the income hike, on a yearly basis. The surplus should be invested in equity mutual funds via SIPs and bring the asset allocation to the recommended level (see table Asset Allocations). The table Inflow/Outflow features current year's cash flow and the projected cash flow of 2019, showing that long-term investment surplus is available over and above their current committed investments. The financial road map presented here is based on the information provided by the couple and plan assumptions are listed at the end. A feasibility study has also been done, taking into account the current assets and investments of the family, along with the year-on-year estimates. But financial planning is not a one-time activity, and regular reviews would help them evaluate and restructure their investments. Short-term targets: As discussed above, the Parashar family should sell the plot and the part of proceeds can be utilised to make a 30 per cent down payment, or Rs12 lakh, when they purchase their residential property next year. It will also help them save on the capital gains tax . They should raise a home loan for 15-20 years to fund the rest. Similarly, the bank balance and the cash in hand can be used for a 60 per cent down payment for the car (around Rs9 lakh, the balance can be paid through a car loan) while Rs2.65 lakh, equal to three months' basic expenses, should be set aside for an emergency corpus/liquidity fund. The remaining Rs2.05 lakh (Rs1.5 lakh from land sale proceeds and Rs55,000 from bank balance-cash in hand) can be used to fund the dream vacation partially. The fixed deposit of Rs3 lakh can also be utilised for this purpose. These funds can be parked in liquid/equity savings mutual fund schemes until utilised. The next two years will also see a vast change in the spending pattern as there will be no rental expenses when the family shifts to their new home and Tanisi starts school. Additionally, Rohit and Maya need to get life insurance cover of Rs4 crore and Rs1.25 crore, respectively, to protect future expenses and critical goals such as the daughters' education. The same can be done in a staggered manner by purchasing term insurance. For health insurance, we suggest that the existing cover should be continued for the parents while a basic cover of Rs3-5 lakh along with a super top-up option of Rs10 lakh should be purchased for Rohit, Maya and their daughters. Super top-up policies along with individual covers are a good option providing for a relatively larger cover at an affordable rate. Further, Rohit and Maya should also buy a critical illness policy of Rs25 lakh each and a personal accident policy of Rs50 lakh and Rs25 lakh, respectively. Long-term goals: As of now, the couple should revise the education corpus to Rs50 lakh and the marriage fund to Rs20 lakh for each daughter. These goals are at current value and duly adjusted in the Goals table. 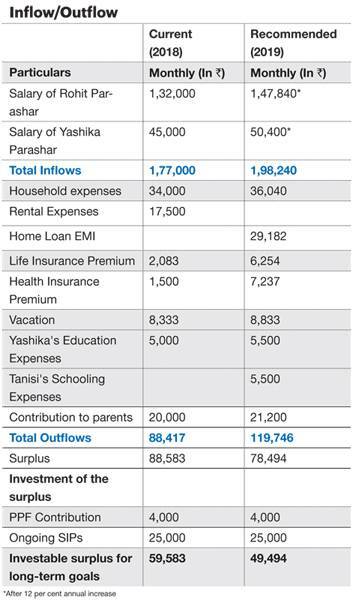 Further, Sukanya Samriddhi accounts can be opened for Yashika and Tanisi. As for the equity portion, investments into mutual funds should be continued through SIP. Next comes the most crucial financial goal, the retirement corpus. During retirement, a total corpus of Rs9.64 crore will be needed to fund their household expenses, medical cost and vacation spending. So, the retirement fund has been planned in three parts - a corpus of Rs7.8 crore for household expenses, Rs1.21 crore for medical and Rs63 lakh for vacation. Their PPF and EPF funds and existing MF mutual funds can be utilised for this goal. Contributions to EPF and PPF, the premiums paid for life and health insurance policies and opting for a home loan will earn Rohit and Maya a lot of tax benefits. For instance, Rohit can avail tax benefit under section 80D against the health insurance premium paid up to Rs25,000 for self and family and Rs50,000 for parents who are senior citizens. Plus, he can get a deduction of Rs2 lakh for interest on the home loan when he opts for it. The couple should have an estate plan in place for ease of asset transfer.